Today we are going to look at what it means to be adopted by our Heavenly Father, it takes time to get to know our natural parents, so we need to put in the time getting to know our Heavenly Father, through reading His word, by worshipping Him. 1Jn4:16(N K J) & we have known & believe that the love that God has for us. God is love, & he who abides in love abides in God & God in him. The Bible tells us many times that God loves us. But how many of God's children still lack revelation concerning God's love? The truth is, very few of Gods people really know how much He loves them. If they did, they would act & differently. Years ago when I came to Christ I was studying how we could receive His love, THEN I suddenly realised I was in desperate need of it myself. The Lord led me in my study to this verse we have just read & emphasised the importance of His love. This means that God's love should be something we are actually aware of. But how does one find this awareness. as you study this subject you will become conscious of God's love for you through thinking about His love & by confessing it aloud. I encourage you to learn the Scriptures on the love of God, & meditate on them, confess them out of your mouth. Over time the revelation of His unconditional love will become a reality to you, as it did for me. His love is so real to me now that even in hard times I am comforted by consciously knowing that He loves me. Can anything ever separate us from Christ's love? Does it mean He no longer loves us if we have trouble or calamity, or are persecuted, or hungry, or destitute, or in danger, or threatened with death? (As the Scriptures say "for your sake we are killed every day; we are being slaughtered like sheep." No, despite all these things, overwhelming victory is ours through Christ who loved us. & I am convinced that nothing can ever separate us from God's love. Neither death nor life, neither angles nor demons, neither our fears for today nor our worries about tomorrow-not even the powers of hell can separate us from God's love. No power in the sky above or in the earth below.-indeed, nothing all creation will ever be able to separate us from the love of God that is revealed in Christ Jesus our Lord. For those of us who are discouraged this is a powerful passage gives assurance of Christ's love, active at every moment in our life. Are any causes of discouragement greater then those Paul mentions? & if not, then we are never separated from Christ's love. 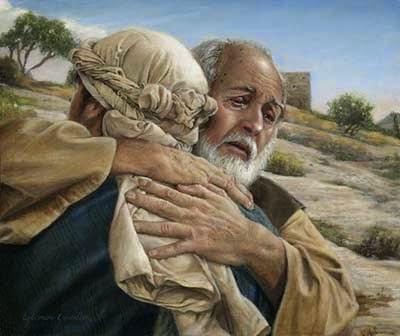 As parents love to give gifts to their children, our Heavenly Father delights in giving to His Children as we see in Matt 7:11(N K J) If then you being evil, know how to give good gifts to your Children, how much more will your Father who is in heaven give good gifts to those who ask Him. & Heb 11:6 NKJ) says... he is a rewarder of those who diligently seek Him. I rejoiced when I finally realised this! I know I made many mistakes in the past, BUT I also know I have diligently sought the Lord with all my heart, & that means I qualify for these rewards. I decided long ago that even though I didn't deserve them I would receive any blessing that God wanted to give me. I hope you will do the same also. We should be thanking Him that every good & perfect gift in our life comes down from Him, & that there is never any variation with Him. Ps 145:8-9 ( N K J) The Lord is gracious & full of compassion, slow to anger & great in mercy. The Lord is good to all & His tender mercies are over all His works. It is God's desire to be gracious & full of compassion, He will not force it on us, He is a gentleman, it is our choice to receive it. Deut 30:19 NKJ) explains it... I have set before you life & death, blessings & curses; therefore choose life, that your dependants may live. Thousands of thoughts are presented to our minds every day, & we must allow our minds to be renewed after the Spirit not the flesh. our carnal or wordily fleshly minds have so much practice operating freely that we think wrong thoughts without much effort at all. On the other hand, we have to purposely choose to think the right thoughts. After we have finally decided to be like-minded with God, then we will need to choose & continue to choose right thoughts. We have choices to make throughout our lives. in Deut 30:19 the Lord is saying to us His children, that He has set before us life & death & urges us to choose life. In pro 18:21 tells us we can choose life or death. & also says that death & life are in the power of the tongue, & they who indulge in it shall eat the fruit that is death or life. our thoughts become our words, therefore, it is vitally important that we choose life giving thoughts. ITim 2:4 teaches that although God desires the salvation of all men He does not violate their opportunity to choose. Our Father will forgive & forget our sins He is rich in compassion & has made way for our sins to be both forgiven & forgotten. Ps 103 :2-3 ( N K J) says, Bless the Lord, O my soul & forget not all His benefits. Who forgives all your iniquities, who heals all your diseases. Rehearse periodically all of God's blessings as a source of encouragement & faith. Ps 103 :12 NKJ) tell us how much we have been forgiven that As far as the east is from the west, so far has He removed our transgressions from us. This verse is telling us that our transgressions shall never rise up in judgement against us, if we thoroughly forsake them, God will forgive them. The sins of believers shall not be remembered. 1Jn 1:9 NLT) tell us what we must do when we sin If we confess our sins to Him, He is faithful & just to forgive us our sins & cleanse us from all wickedness. Notice that it says if we will confess our sins to God , He will cleanse us. I believe this is the spiritual parallel to the way our physical blood continuously cleanses our body. Just as our blood works for us all the time to keep us cleansed from all poison, the blood of Jesus works all the time, continuously cleansing us from sin. This verse clearly states that there is only one requirement on our part & that is to freely admit that we have sinned & confess our sins. An example is of Jesus healing the sick is shown in Matt 8:15-18 (N L T) When Jesus arrives at Peters house, Peters mother in law was sick in bed with a high fever. But when Jesus touched her hand, the fever left her. Then she got up & prepared a meal for Him. That evening many demon-possessed people were brought to Jesus. He cast out the evil spirits with a simple command, & He healed the sick. This fulfilled the word of the Lord through the prophet Isaiah, who said He took our sickness & removed our diseases. In verse 15 we see that the cure was immediate & complete & as evidence she served Him. This verse teaches that timidity which is the same as fear, is not from God & that God gives us power, love, a clam & well balanced mind, discipline, & self control. Fear will never stop coming against us. we must learn to do what God tell us to do whether we feel fear or not. we must do it, afraid or not if necessary, but that is what courage does; it feels the fear & does it anyway. We are not cowards if we feel fear. We are cowards only if we let fear rule our decisions. In Rom 8:15 NLT) Paul explains So you have not received a spirit that makes you fearful slaves. Instead, you received God's Spirit when He adopted you as His own Children. Now we call Him Abba Father. Abba is the Aramaic word for Daddy so we can call Him Daddy God. This verse tell us that the Holy Spirit is the Spirit of adoption. Here, the word adoption means that we have been bought into God's family even though we were previously outsiders, unrelated to Him in any way. We were sinners serving satan, but God in His great mercy redeemed us & purchased us with the blood of His own Son. Think of yourself as a child of God that you are loved, accepted, & empowered by His unconditional love for you. Jn 17:23 NKJ) I in them & you in me, that they made be made perfect in one, & that the world may know that you have sent Me, & have loved them, as you have loved me. This verse is teaching us to commit ourselves to bringing unity in the Church. Godly living is, living in, through & for Jesus. Godliness can be summarised in three words: love, obedience, & unity. By living godly lives, we learn to see things as God does & adopt His word as our only standard. The Lord is my Shepherd; I have all that I need. He lets me rest in green meadows; He leads me me beside peaceful streams. He renews my strength. He guides me along right paths, bringing honour to His name. Even when I walk through the darkest valley, I will not be afraid, for you are close beside me, Your rod & your staff protect & comfort me. You prepare a feast for me in the presence of my enemies. You honour me by anointing my head with oil. my cup overflows with blessings. Surely Your goodness & unfailing love will pursue me all the days of my life, & I will live in the house of the Lord for ever. This Psalm is so comforting. In it David tells us that our Heavenly Father leads, feeds, guides, & Shields us. He causes us to lie down & rest, & He refreshes & restores our lives. (V3) I really like the way the K J puts this verse " He restoreth my soul". I like the word "restoreth" word The soul is comprised of the mind, the will & the emotions. With our souls, we process our circumstances, we entertain our thoughts, we feel & express emotions, & make decisions. What a wonderful promise- that God our Heavenly Father will restore our souls! The word restore means to bring back into existence or use. Or to bring back to an original state or condition. The word is often used in a situation when a dethroned ruler is put back on his throne. Restore also means to make restriction or refresh. When David says God will restore our souls & our lives, he means that God will return us to the same condition we were before we erred from following the good plan God had predestined for us before our birth, or before satan attacked us to draw out of God's plan for our lives. We can take confidence that Our Heavenly Father will lead us in the path of righteousness, uprightness, & right standing with Him. I think David is saying here that God individually leads us each in the path that is right for us, a path that restores us in every way to the good places God has for us. Our Heavenly Father has a path predestined for your restoration. If you will allow Him to do so, He will guide you by His Holy Spirit along the unique way that leads to restoration to being able to fulfil the great purposes He has for you. Hab 3:7 teaches us that our Heavenly Father promises to be our strength, He is the God of our salvation. That means He delivers us & provides a way out of trouble in which we find ourselves. It is so important to keep rejoicing even in times of trouble, because the joy of the Lord is our strength (Neh 8:10). Depression, discouragement, & despair only weaken us, but being positive & finding something to rejoice about adds energy to our lives. Even if you cannot find something to rejoice about you can rejoice over your relationship with the Lord. HE is your joy, not your circumstances. When we trust in God, He enables us to make spiritual progress even during times of trouble. Through Him we can keep walking forward. I have heard it said "keep walking when the devil is stalking." Satan's favourite tool to use against God's children is fear as I mentioned earlier. Fear immobilises us if we let it, & it prevents us from making progress. But thank God that in Him we can still make progress even in times of trouble. We tend to think that the highest place to be is on the mountaintop with no problems & everything going our way, BUT that is no true according to God's word. He says that our high places are trouble, suffering, & responsibility, but He promises that He will give us hinds feet. ( Hab 3:19) A hind is a type of mountain goat can leap about freely on the rocky & difficult slopes, they climb mountains with seemingly no effort at all because the way God has made them. So look to God as your strength, & trust in Him to help you make progress during trouble. In Jn 14:6 NKJ) Jesus said that I am the way , the truth, & the life. No one comes to the Father except through me. Recognise that Jesus is the only way to our Heavenly Father, we must know Jesus to know God. Jesus said that He is the way, it is so very important that we see that Jesus has certain ways of doing things, & if we will submit to His way, everything will work out. BUT so often we wrestle & struggle with Him, trying to get Him to do things our way. It just doesn't work. Let Jesus be the Way in your life. Acknowledgement I Believe An introduction To Christian Living Rhema Family Church.